A patient’s state of mind, in addition to the wonders of modern medicine, is a critical factor in their return to health. An examination and procedure room filled with calming colors and attractive materials elevates the mood of patients. Consider the essential role of design in health care. Hospitals are continually striving to take the anxiety and stress out of their environments so patients, families, and staff can focus on care and healing. 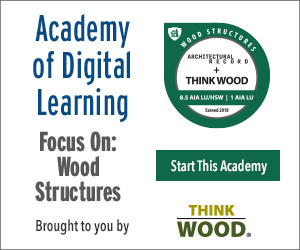 For architects and designers, this means it’s essential to create a tone of serenity with attention to safety, hygiene, efficiency, and quality. Patient rooms, nurses’ workstations, lobbies, waiting areas, cafeterias, restrooms, and more can be designed to reduce stress through the use of calming colors, antimicrobial surfaces, and soft patterns that support both the patients’ and families’ environments and the hospital’s brand and reputation. With the right specification of surfaces, a health-care design can achieve the perfect balance between utility and beauty. According to Rebecca Donner, principal at Inner Design Studio in Brentwood, Tennessee, neutral palettes continue to drive design with brighter colors used in accent elements, such as walls. Amy Higgins, director of interior design and associate at HMN Architects, in Overland Park, Kansas, is also using a wide range of warm earth-tone palettes for health-care clients that seek to avoid overly trendy looks and want to remind patients and family members of home. Durability across all elements rings true for Higgins as well. 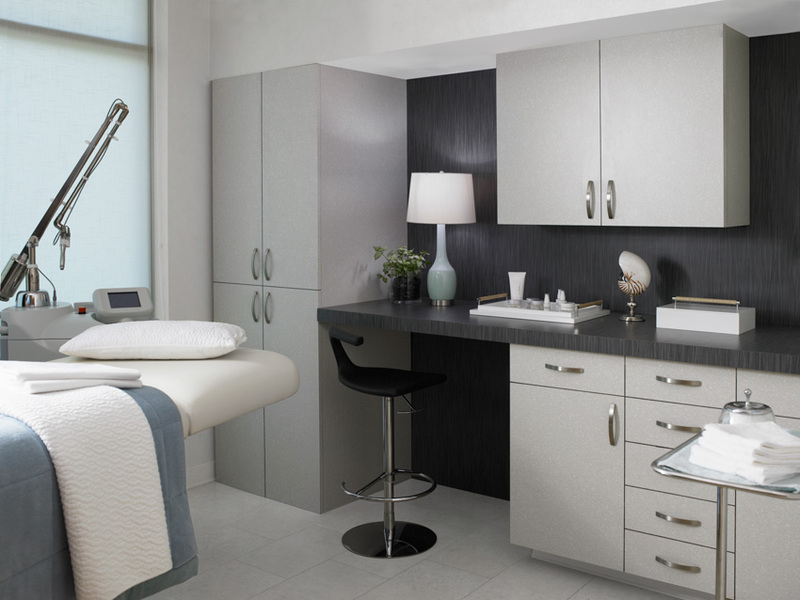 She says that her health-care clients leverage a lot of solid surfaces with antimicrobial properties for high-traffic countertops such as nurses’ stations, reception desks, and patient rooms. With round-the-clock usage, these typically require frequent cleaning and may be exposed to water. The ideal patient room, as demonstrated in this rendering, offers views of nature and also surfaces and materials inspired by nature. To demonstrate the aesthetic harmony possible in a health-care setting, let’s examine a rendering that represents a VIP hospital patient room. It was designed by Donner, a leading authority in health-care design, with more than 26 years of experience in the field. Today, her nine-person Nashville firm handles approximately 690 projects a year and has designed the interiors of more than 500 health-care facilities across the United States. 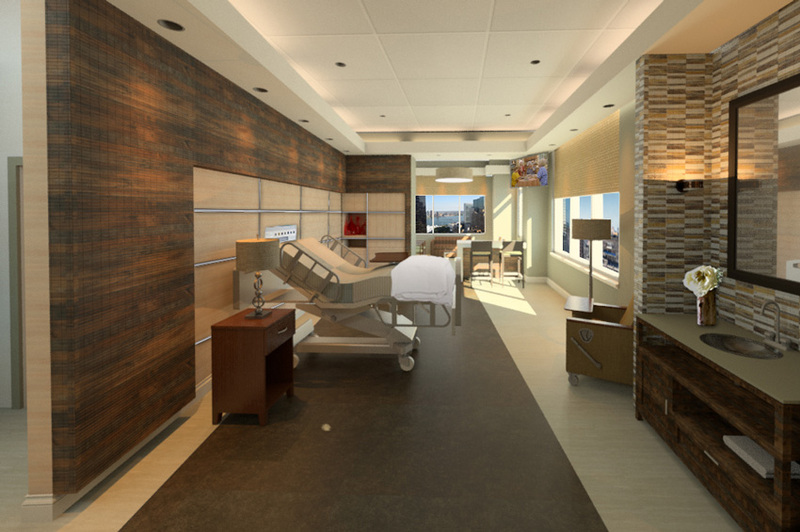 In this rendering, the room is oversized to house both a gathering space for family as well as a patient area for resting. The space has its own bathroom, television, and seating area. A shared technology spot at bar height gives an area to both work and/or dine. The hospital bed is placed perpendicular to the exterior windows, allowing the patient to take in a panoramic view of the outdoors while also feeling relaxed with touches of nature from the indoors. Many of these attributes would be less appealing if the aesthetic of the room was bland, sterile, or mismatched. It is none of those. The palette used in this room, developed by one of the world’s leading surfacing manufacturers, was inspired by nature. Subtle, soothing hues from a forest environment are brought to light in the dual-tone wood-laminated patient head wall, highlighted by patterns of salvaged planked elm and washed knotty ash. These finish colors are complemented by the stained-glass tile surrounding the patient room sink, parallel to the head wall. The floor pattern and color continues this scheme while anchoring the room finishes. A subtle accent of sage green with a golden brown is placed on the countertop with the sink and painted on the exterior walls. The overall design strategy was to keep the palette fairly neutral, allowing the finishes to cultivate a relaxing and timeless environment in a VIP hospital room. The atmosphere becomes calming due to the balance of naturally inspired patterns and colors selected from the manufacturer’s palette. Now that we’ve observed an ideal patient room, let’s look at the areas of a health-care environment that need both superior function and a pleasing aesthetic. Various spaces in a health-care facility call for different kinds of surfacing materials. Walls need to be extra durable against impacts, while laboratory counters need to resist the growth of microbes. And for intake countertops, fingerprints are a major problem to be solved. In each case, the solution is likely a high-pressure laminate (HPL) product, or a solid surface product. The functional attributes of each type of product—antimicrobial factors, durability, cleanability, etc.—may not be evident to the casual observer. But variations in colors and patterns from different manufacturers will be disconcerting. Therefore it is advised that surface products used are sourced from one manufacturer, if possible, whose patterns and colors coordinate across various product lines. This is preferable to a scattershot approach to specification from a variety of sources. It helps to understand what HPLs are and how they are made. HPLs consist of layers of specially selected papers impregnated with thermosetting resins and bonded together under heat and very high pressure. The resulting HPL is a homogeneous, high-density sheet that is used for a wide variety of surfacing applications. High-pressure laminates are resistant to impact, wear, heat, and staining. They perform well in demanding environments where hygiene and cleanability are important. HPLs are highly resistant to impact, wear, heat and staining and provide a hygienic, durable, and easily maintained surfacing solution for the most demanding of environments. They can be fabricated to produce curved surfaces which, with their absence of visible seams, will eliminate joints on internal and external angles in which dirt, liquids, mold, bacteria, viruses, and other contaminants can accumulate. Also, the wide variety of sheet sizes offered enables surfaces to be designed and manufactured with the minimum number of joints or seams. This is especially applicable in environments where a hygienic, cleanable surface with minimal seams and crevices (offering minimal harbor for germs) is desirable. The inherent physical properties of HPLs help meet the strictest of cleaning and maintenance regimes, without the need for further additives or treatments. Because the surface is completely sealed, quality decorative laminates are impervious to liquids and are very easy to clean and maintain. Laminate surfaces are best kept clean simply by using water and mild detergent. Non-scratch liquids or creams are recommended for stubborn stains. HPL is inert and does not support microbial growth. As an example, independent testing on a leading manufacturer’s laminate for antimicrobial activity and efficacy demonstrated an inert control surface (no chemical reaction) after 24 hours of incubation for all of the tested organisms: Staphylococcus aureus, Escherichia coli, Candida albicans, and Aspergillus brasiliensis. Today’s laminates come in vibrant upbeat hues, nature-inspired tones, and well-chosen neutrals that go with everything, including modest budgets. A designer can mix and match solids, wood grains, graphic patterns, or stone looks to achieve a project’s goals. Laminates come in various grades for various applications. 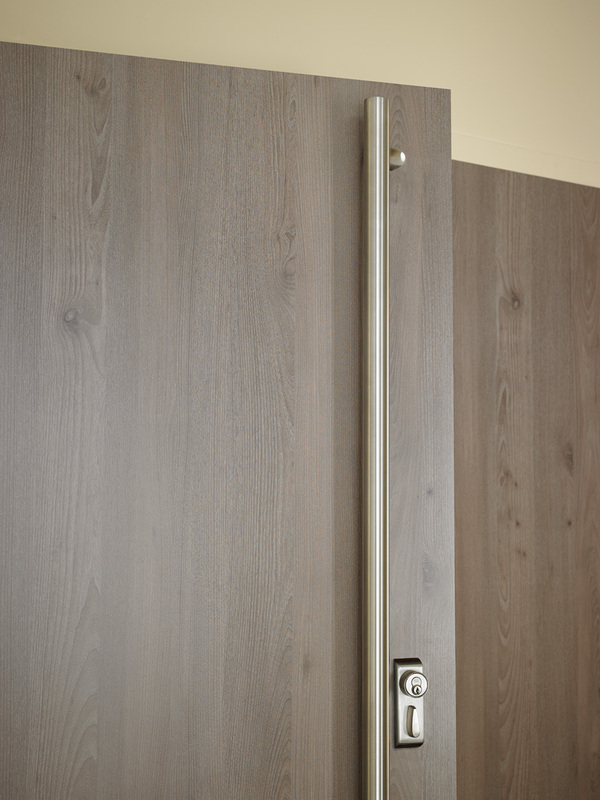 The two most common laminate grades for health-care settings are Grade 12 HGP (horizontal postforming) and Grade 20 VGP (vertical postforming). Grade 12/HGS (horizontal general purpose) is intended for application to interior horizontal or vertical surfaces where design, appearance, quality, durability, resistance to stain, and resistance to heat from ordinary sources are important considerations. Grade 20/VGP is intended for application to interior vertical surfaces where design, appearance, quality, durability, resistance to stain, and resistance to heat from ordinary sources are important considerations.